Last year N.Y.Roll and I put on what N.Y.Roll dubbed as the "Iowa Gravel Expo/Bike Party". I was asked to help promote and facilitate it as the speaker. Our focus was to bring a light to the gravel scene and shine that also on beginners, or what we sometimes call "gravel curious folk", who wonder about gravel riding and if it is for them. I figured it was only going to attract a few locals. If we got 35 people, or so I thought, it would be considered a success. Now, I have to say that N.Y. Roll thought it would be much better attended than that and in the end, he was right. We had standing room only and something like 85+ people up there! So, with such an attendance and enthusiastic response afterward, we planned on doing the Expo again the following year. This attendance issue brought N.Y. Roll and I a lot of concern, and we were constantly bouncing ideas off one another for months leading up to the next Expo. Possibilities such as having vendors, maybe some media, and of course, a bigger venue than we had for "Year One". However; in our efforts to keep the event local, we were met with several road blocks. Things like parking, alcohol serving limitations, how to cater food, space costs, and location of venues all were huge roadblocks for our event as we had meager resources for such big plans. To be sure, Cedar Valley Cyclists and Europa Cycle & Ski, both financial supporters in our efforts, plus our first year and eventual second year host, Doughy Joey's Peetza Joynt, are to be commended for stepping up to the plate and helping us. Without them, nothing would have happened, but the resources we had, as wonderful as they were, didn't have the horsepower to launch the event to the levels we were thinking. Attendees were treated to free Doughy Joey's Peetza courtesy of our sponsors. In the end, the attendance issue really became our perceived biggest problem and the one that kind of has pushed us toward a new idea for this event going forward. That will be discussed later. The end result was that we came up with the idea to have two sessions and to kind of corral people into choosing one or the other to attend and we ran with that. This allowed us to use the same venue and its benefits. It ended up working out really well with comfortable amounts of room for everyone in both sessions. Had we run one session as we did our first year, the room wouldn't have held everyone that attended this year. Blame that on fire codes. It is what it is. So, we had eleven presenters, some from first time events, and all are Iowa based events. We had BikeIowa.com, one of our sponsors, who sell the Pogie Lites I reviewed, and have a great calendar of Iowa based gravel events on their site as well. We also had a great presentation by Andrea Cohen of the Gravel Scouts. Both sessions were well received by attendees and everything went pretty smoothly. We had some nice schwag handouts with cool stickers, chain lube samples from DuMonde Tech, and slap koozies from Bike Iowa. Doughy Joey's staff kept the pies coming and the beer flowing and accomplished all that smoothly and unobtrusively. The venue was excellent in that way. I think we maybe could have used a small P.A., but that would have brought it's own issues and we would have had a different set of problems there since the upper room we used isn't sealed off from the remainder of the public space there. All in all, it was the best it could have been. N.Y. Roll and I are grateful to the staff and owners of Doughy Joey's for allowing us the opportunity to put the event on. Dan from the Snaggy Ridge 105 telling us how the gravel based event has affected Tipton, Iowa. The takeaways I gathered from this Expo were many. I learned more about how gravel cycling events are benefiting small towns like Tipton, Alden, and Lynville, Iowa. 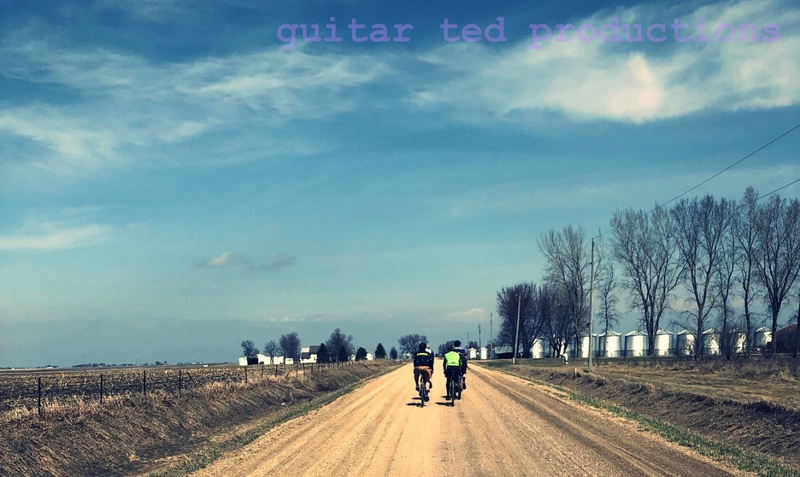 I learned how initiatives to promote healthy living are affecting people in Grinnell, the Iowa City area, and Alden Iowa and this from gravel based events and organizations. I saw event directors with a lot of experience rubbing shoulders with inexperienced directors and LOTS of shared information was dispersed during the Expo. We also hosted Mark Wyatt of the Iowa Bicycle Coalition, and his ideas along with those of Scott Sumpter of Bike Iowa are going to help shape what the Expo will become in the future. Which brings me back to the point I alluded to earlier. The point about attendance. On one hand, we cannot really facilitate more people using the venue we have used. It is limited and we understand that. The event has potential to help more cyclists and event directors. It has the potential to help civic organizations and local governments to promote rural Iowa. The event has growth potential in terms of businesses involved in cycling and gravel cycling in particular. The potential is not going to be realized where we are now, so things must change to get this event where it has the potential to go. What will that look like? Well, I cannot say for certain. We heard a lot of ideas, and there has to be more people brought into this to help guide the future of the Iowa Gravel Expo. One thing is for sure, maybe two- That is that Waterloo/Cedar Falls is probably not where the event will end up, although there is one idea floated out there which would make the event "multi-centered", so to speak. The other thing is that N.Y. Roll's and my guidance in this event is not enough, and has the distinct possibility of ending. It's something that has to be on the table for this idea to grow, and in my opinion, the idea is too good to be limited by my and N.Y. Roll's limited resources. In the meantime, what N.Y. Roll and I have started is a success. We think, and many others do as well, that it is an awesome concept that has great potential. I know that I will be involved in the short term, at the least, in where the event goes from this point. THANK YOU: Sponsors- Europa Cycle & Ski, Cedar Valley Cyclists, Dave Roll, Riding Gravel, Bike Iowa, Doughy Joey's Peetza Joynt, Andrea Cohen/Gravel Scouts, Scott Sumpter/Pogie Lites, The Event Directors, DuMonde Tech, Mark Wyatt/Iowa Bicycle Coalition, and most importantly- all the attendees who came to learn more about Iowa based gravel events! That looked like a lot of fun! Wish I lived closer.